The highest peak of Adriatic arhipelago (780m). The hiking trail from Gospa Karmelska in Bol lasts for 2 hours, but meny prefer road path (18km): Supetar - Nerežišća - Knežeravan (with sheperd stops - specially recommended to see the one in Gažul) - Vidova Gora. This path alows you to see all varietes of Brac nature with endemic types of black boron trees. The mountain got its name by the ruins of church St. Vido, which is 100m from the top. The church is named by the ancient Slavic cult of Slavic god Svetovid. The Panorama from Vidova Gora is something not to be missed during visit to Brac island. Deep down you can see the golden finger of Veli rat, the series of Brac bays, and on the other side is the northern side of Hvar island, peninsula Pelješac, Korcula, Vis, all the way to Jabuka. During specially clear days, Monte Gargano on Apenini (Italy) can be seen. 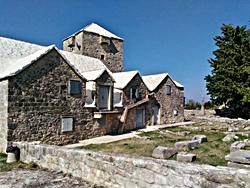 Pustinja Blaca, once famous desert of monks, and later observatory, is situated on the east part of the valley on the south side of Brac island, between Bol and Milna. Easy aproach is possible trough the wide road from Blato bay or by footpath from the middle of the island trough Nerezisca, Zurmo (old christian watering place for horses and mules), and Dragovode (with houses of old Brac sheperds). In the cave called Ljubitovica in the steep valley on the south side in 1551., 2 priests from Poljica have established an place which soon evolved in to the desert monastery. Among 11000 books in monastery library, most of them are written before 1800. and the archive shows that trough generations data was collected carefully including economics and everyday field work, the beggining of plant growth, harvesting, climate changes etc. Blaca has preserved its inventory, today presented in the museum. Particulary valuable is the astronomical legacy of the last Blace desertman (priest) don Niko Miličević. Skrip is the oldest settlement on the Island of Brac (the name is latin "scrupus" = sharp large stone). Under the settlement there are well known quarries Plate, Strazisce and Rasohe where the stone was collected for the Salona and Diocletian palace, with the protection from Heraklo. There were also masonry workshops there from the later antic times which distributed characteristic sarchophagus from Ravenna to Akvilej..
From Skrip quarries ther was black marble collected and church furniture was made throughout Dalmatia. There were big blocks lifted and transferred to the port of Splitska where still in these days, monumental blocks can be seen as leftowers which fell to the sea. Around the picturesque castle of Radojkovic (there is a museum of Brac with archeological findings of Brac tools), there are good remains of walls which surrounded Iliric settlement (8000 m2 area). The founding od Mikenic ceramic opens the possibility of Greek colonization, and lot of churches and basilics make a Skrip unique place which gives us insight in all historical ages and thousands of years of life continuity on Brac.